Have you taken a breath today? I mean really, truly, stopped and just breathed? No? I figured. Do it now for me. Inhale deep and slowly exhale. Feels good, right? Now I want you to listen very closely. I’m going to say things you don’t want to hear. But you need to. Perfect is a word you’ve so desperately strived for all your life. You’ve carefully set so many things into motion and if everything goes according to plan, it all works out. But, what if it doesn’t? Do you know how to be okay not being perfect? Have you learned your limits yet? Have you learned when to say when? When to say no? I didn’t think so. Because I’m her too. And when the waves beat against the ship too hard, I don’t turn around and retrace my steps like I should. I don’t find that easier path. I continue on, feeling the burden of my choices, of handling too much, and pray to God that I don’t end up washed ashore. And I know you are right there with me. When was the last time you did something for yourself? When was the last time you relaxed? Did you always feel the need to be this way? When did you become the person who puts too much on her shoulders, who says yes to everything? When did you stop thinking of your own well-being? It’s okay to ask for help. It’s a scary thought, not being all you hoped you could be. I know. But asking for help, and accepting that help, is just as hard as going at it alone. You weren’t made to be a superhero. She was right. Being superwoman has negative effects on your mental and emotional health. How are you supposed to help others when you’re barely holding it together? You just can’t. You have to be brave, and bold, and say, “No. I can’t help you with that,” and “I’d love to but I don’t have capacity for that,” and, most importantly, you have to learn to say “I’m having a hard time. I could use some help,” and then actually let them help you. You can be Superwoman sometimes. You can be the girl who can conquer anything. But don’t let the fear of not being perfect, keep you from taking care of yourself. You can’t do it all. And that’s okay. I did inhale deep and I had shivers on my skin. This is exactly what I (another superwoman in this world) needed. 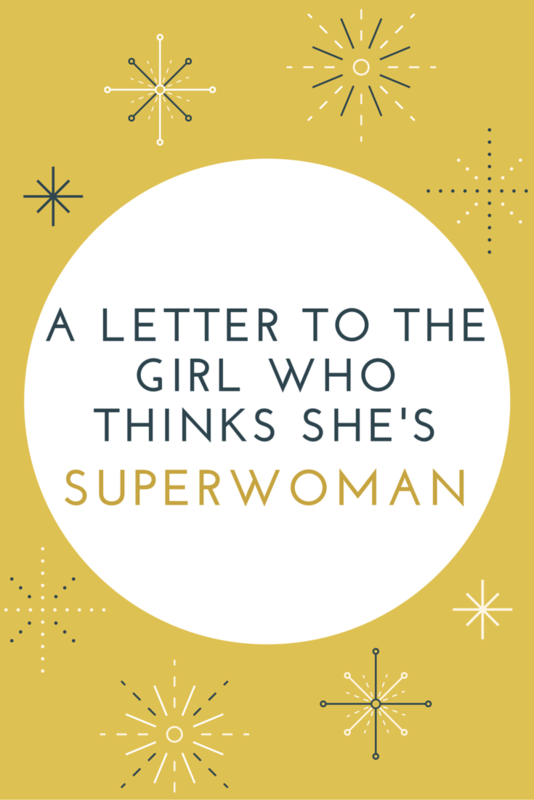 So glad it was what you needed, superwoman! ? Beautiful! It’s good to slow down for a minute and not get carried away with being perfection obsessed. Thanks for the reminder. I really should read this a few times a week 😀 Maybe then I learn how to take a real break. I always set up impossible goals and tasks for myself and have to actively work on toning them down. I totally agree that you cant be perfect. We tend to be actively seeking to be perfect and close to perfect. We need to give ourselves some break. Thanks for sharing! Totally agree. If we don’t give ourselves a break, who will?? This definitely reached me. Especially right now when I’m struggling to be everything for everyone and it’s not always easy to remember that it’s best to focus on myself first sometimes or I’ll burn out and be of no use to anyone. Thanks for the reminder. Working on myself is something I’m definitely working on too. Sometimes it’s so hard to say no to people’s requests, but learning to do so makes you SO much more centered with yourself. You can’t do everything for everyone without getting burnt out. Glad to hear you’re working on it too! I can definitely relate to this post. As a college student who’s trying to do ten million things all at once, and perfectly as well, sometimes I stretch myself a bit too much. Then I get to the point where I’m overwhelmed and just relieved when I have any sort of break. It’s important to remember to take time for yourself, not for your career, not for your friends, just yourself. Most don’t realise how important that is. Completely agree. Glad to hear you’re learning to take care of yourself! 🙂 love this! I struggle with this a lot. I always take on too much and put a lot of pressure on myself. I suppose I need to learn it’s OK to say no. Or leave something till I’ve got enough time! Focus on the most important things. Excellent reminder to look after myself so I can look after others! Totally agree! We all need to take a deep breath sometimes and accept a helping hand.